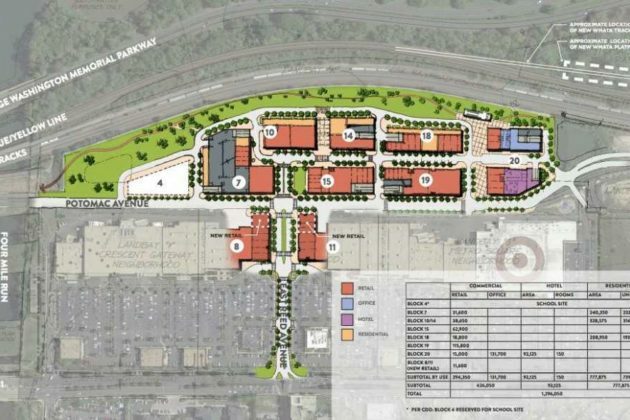 The redevelopment of North Potomac Yard in Alexandria gathered more steam last week, and residents in Crystal City are keeping an eye on its potential impacts. North Potomac Yard is in the northeast corner of Alexandria, just across the Arlington County line, near a planned Potomac Yard Metro station. It is currently occupied by a Regal movie theater, a Target and other big box stores and restaurants. 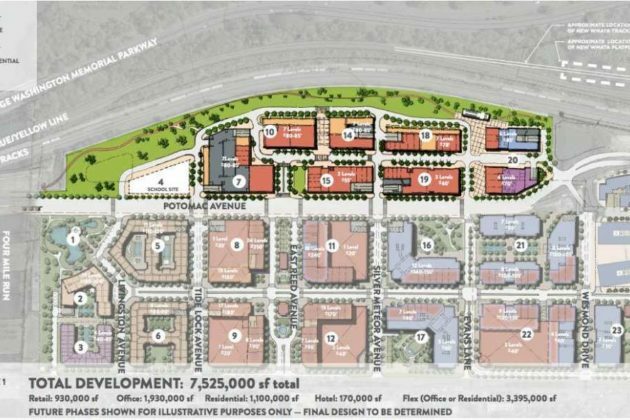 The City of Alexandria is in the planning process for a massive mixed-use development at the 69-acre site, to include retail, residential units, a hotel and office space. On February 22, city staff released the first draft three chapters of the updated plan, then the following day met with the Crystal City Civic Association at its general meeting. Association president Christer Ahl told ARLnow.com that his members are most concerned that Crystal City will be left behind as nearby developments spring up in Arlington and Alexandria. “Perhaps the larger issue which the project raises is whether it could contribute to the notion of Crystal City becoming a ‘backwater,’ stuck with many old buildings which at best might be renovated, while the Rosslyn/Ballston corridor and Potomac Yard in two very different ways will be full of exciting new development,” he said. Ahl added that many in the area are also concerned with the impact on traffic along Crystal Drive and Route 1 from the new development, which could total as much as 7.5 million square feet. The Alexandria City Council voted to approve the new Metro station in May 2015, to be located on the Yellow and Blue lines between the Braddock Road and National Airport stops. While the new Metro station and the Metroway bus rapid transit route along Route 1 could take care of a lot of traffic impact, Ahl said, there were still concerns about the number of cars to hit the roads with the new development. One other aspect that Ahl said troubled some association members is the potential loss of amenities like the movie theater and Target, which are major draws. But he said members will continue to monitor the situation and see how it evolves. 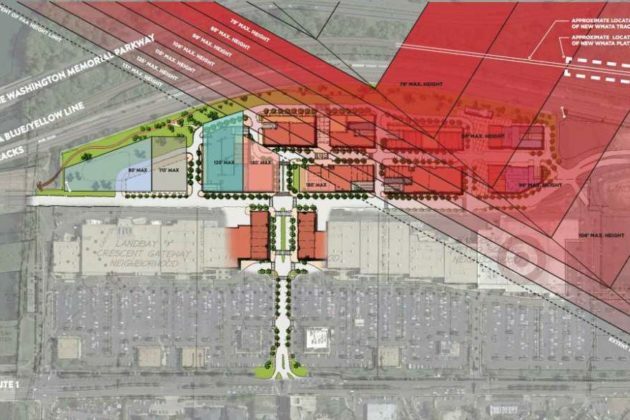 According to a timeline, an advisory group tasked with updating the North Potomac Yard plan will present its final recommendations in April.